DSD Konstruktion d.o.o. is a company for design, execution and erection of steel and composite strucures, founded in 2002 as an affiliate of the German DSD Brückenbau GmbH from Saarlouis. It is part of the DSD Steel Group. 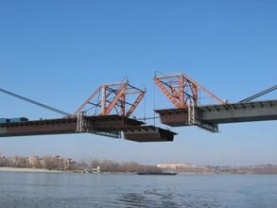 - Road and railway bridges, canal bridges, footbridges and movable bridges with machinery in all-steel and composite construction, large-span bridges as suspension and cable-stayed bridges, fly-overs, temporary bridges as well as repair/refurbishment, maintenance and rehabilitation of steel and composite bridges. - Building construction, disassembling and reconstruction of industrial facilities including logistics, electric power stations and facilities for purification. High quality and safety standards are characteristic to the entire DSD Group. Well-trained and experienced employees deployed in teams, from the technical office to the construction site, make up the basis of our success. The DSD Steel Group employs around 2000 employees around the world, and realises an annual turnover of around 250 million Euros.